Day 2 Kuala Lumpur: On arrival at KL International Airport you will be met and transferred to your hotel. The remainder of the day is at leisure to relax or to perhaps explore this wonderful city. Day 3 Kuala Lumpur/Cameron Highlands: Morning departure from Kuala Lumpur. 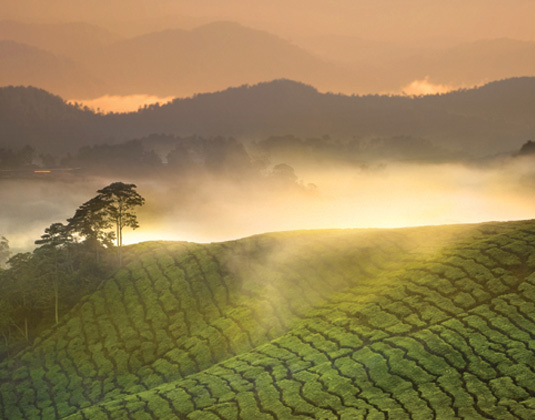 Travel north to the hill resort of Cameron Highlands, which is synonymous with horticulture and tea plantations nourished by fertile and rich terrain. En route you will visit the Orang Asli (Malaysia Aboriginals) settlements where you may chance upon them hunting using blowpipes with poison darts. This afternoon, visit vegetable and fruit farms along with a tea plantation and its processing plant (approx 132 miles/5 hours drive). Day 4 Cameron Highlands/Penang: Visit a farmer's market before travelling downhill to Ipoh, the city of tin mines. After lunch, stop at the Sam Poh Tong Cave Temple, an impressive work of art and faith, before continuing to Kuala Kangsar, the royal town of Perak. View the majestic Ubudiah Mosque and admire the old and new Royal Palace before crossing the Penang Bridge, the longest in Asia as you head to Penang (approx 178 miles/5 hours drive). Day 5 Penang: Explore the streets of Georgetown and its rich heritage, recognised as a UNESCO World Heritage site. Take a leisurely trishaw ride through Chinatown to visit Peranakan Mansion which showcases some priceless antique collections. Last stop is Wat Chayamakaralam which houses one of the world's largest reclining Buddhas, and the colourful Burmese Temple next door. Afternoon and evening at leisure. Day 6 Penang/Kota Bahru: Early departure to the east coast of Peninsula Malaysia. The journey to Kota Bahru traverses changing terrains and lifestyles. The state of Kelantan, translated as "Land of Lightning", is a veritable treasure trove of delights, rustic fishing villages, verdant paddy fields and palm fringed beaches (approx 240 miles/5 hours drive). Day 7 Kota Bahru/Kuala Terengganu: Morning departure for Terengganu, a journey which takes you by traditional Malay fishing villages and unspoilt beaches dotted with colourful fishing boats. Arrive Kuala Terengganu town mid-afternoon, and enjoy an orientation drive along the 'long roof' in Chinatown. Stop for lunch at local restaurant and then visit the cultural Central Market before arriving at your hotel (approx 33 miles/1¼ hours drive). Day 8 Kuala Terengganu/Kuantan: Start your journey to Kuantan after breakfast, passing the picturesque fishing village of Kemaman and the colourful palm-fringed village of Cherating. Upon arrival, the rest of the day is free at leisure (approx 193 miles/3 hours drive). Day 9 Kuantan/Kuala Lumpur: After lunch, transfer back to Kuala Lumpur, where you can enjoy time at leisure. If time allows perhaps visit the Petronas Twin Towers, the Jamek Mosque or Merdeka Square (approx 162 miles/ 4 hours drive). Day 10 Kuala Lumpur: At leisure for sightseeing or shopping until your transfer to the airport for your onward journey. Alternatively, you may wish to extend your holiday? Departures: Second Sunday of each month and operates for a minimum of 2 passengers. Meals: Breakfast. Lunch also included on days 3, 4, 6, 7 and 8. Accommodation: 4* Corus Hotel KL; 4* The Lakehouse, Cameron Highlands; 5* Parkroyal Penang; 4* Renaissance Kota Bahru; 4*Primula Beach Resort Kuala Terengganu; 4* Swiss Garden Kuantan and 4* Swiss Garden KL. Tour price: The price shown is based on the best value travel dates in low season and includes international flights, transfers between the airport and your hotels, accommodation, services of an English speaking guide, sightseeing as outlined and entrance fees.